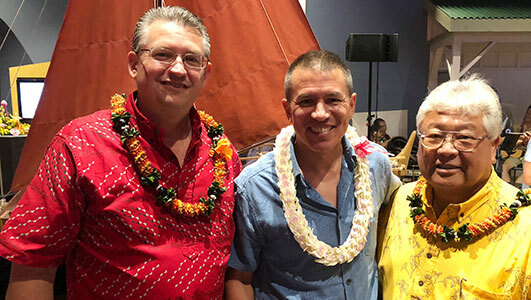 In a concerted effort to stimulate tourism, Norwegian Cruise Line (NCL), along with the Island of Hawai`i Visitors Bureau, hosted a private event in Hilo yesterday – attended by PressToday’s Greg Coates – to celebrate the culture, history and people of Hawaii. The cruise line also announced a new, limited-time free (and reduced) airfare promotion. Focused on educating and reacquainting prospective visitors with the 50th state, the cruise line and visitors bureau welcomed government officials and top travel professionals from across North America at the `Imiloa Astronomy Center in Hilo. 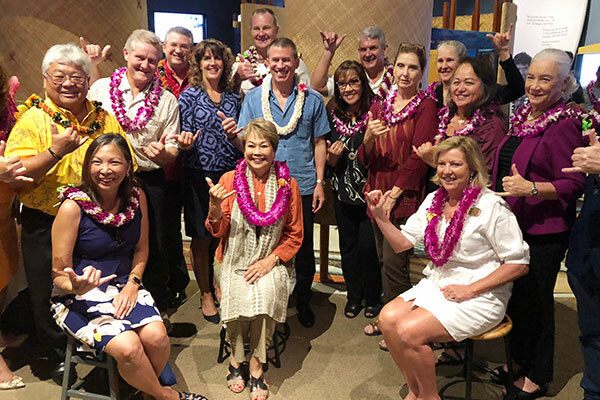 Andy Stuart, president and chief executive officer of Norwegian Cruise Line, Ross Birch, executive director of the Island of Hawai`i Visitors Bureau, and State Representative Richard Onishi addressed the group, each emphasizing the tourism opportunities across the Hawaiian Islands. Stuart discussed the company’s long-standing support for the destination and its 14 years of offering inter-island sailings year-round from Honolulu. He also announced the company’s most recent effort to encourage travel to Hawaii – a new Free At Sea offer which provides free and reduced airfare from 37 US airports, as well as from Vancouver, beginning Oct. 4. Agents can view promotion details at https://www.ncl.com. Each year, NCL draws more than 111,000 travellers to Hawaii and adds close to US$436 million to the state’s economy. In addition to yesterday’s event in Hilo, NCL is currently hosting more than 50 travel professionals aboard Pride of America this week. For more on NCL and Hawaii, watch for upcoming issues of Canadian Travel Press and Travel Courier. NCL president Andy Stuart (c) with Ross Birch, executive director of the Island of Hawai’i Visitors Bureau, and Richard H.K. Onishi, state representative. Local officials give the ‘thumbs up’ to NCL and to Hawaii.